By Blaithin Henehan | March 9, 2011. The Liberties is home to many successful and long-standing businesses. I can think of no better example than The Liberty Florist. Spring is in the air as I catch up with Kim Buckley, a local entrepreneur who seems to have all the answers. I asked her 20 questions on the life and times of a trader in the Liberties and how she’s kept her business going during these hard times. Kim was born and bred locally. Flowers have always been a part of family, going back as far as her great grandmother Biddy McGrail, a local fixture who sold beautiful flower arrangements from her pram. Flower arranging is a legacy in the Buckley/McGrail family that will surely continue for years to come. Kim says that although she has studied the art of flower arranging, her true knack for it is in her blood and has been passed down through the generations. I asked Kim why she decided to open a flower shop and her reply was surprising. “I saw a vacant premise on the corner here, and I was young and foolish so I just went for it.” In retrospect Kim had just returned from studying at the college of marketing and design in Jersey, she had a keen interest in flowers from a young age so it was an obvious choice for her. 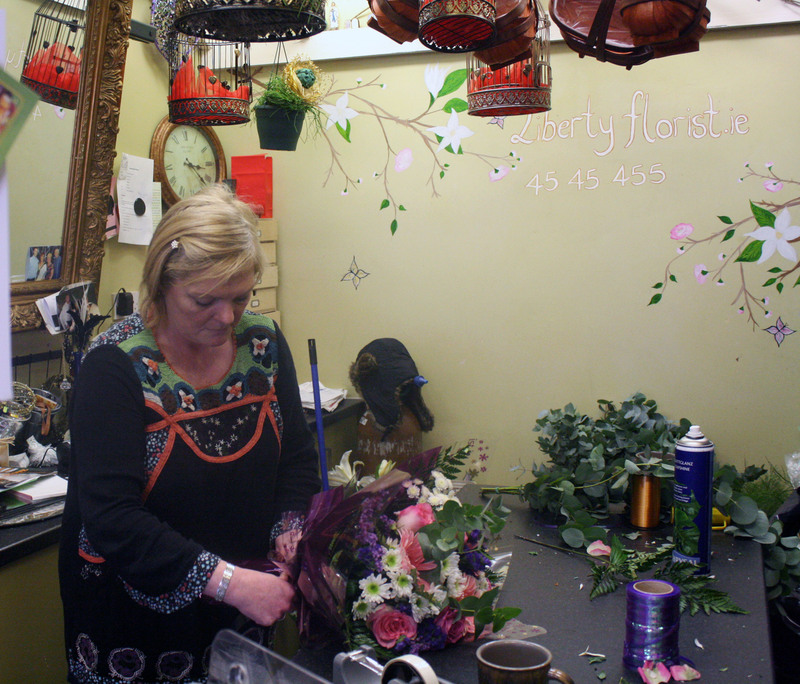 The name Liberty Florist is self explanatory, Kim wanted something simple, recognisable and it does just that. The building was originally called the Pride of the Coombe, the family decided to change the name to avoid confusion. I walk into the shop and Kim’s mother and father greet me. You can tell immediately that this is a family business. Towards the back I spot Kim who is multi-tasking like any good business owner, arranging a bouquet while she chats to those around her. I can see she is extremely busy but she agrees to give me a few moments while she continues to work. When we began the interview Kim has just begun to put an arrangement together, by the time we finished she had created something magnificent, a present for a patient in St James’s. It’s clear flowers are Kim’s passion. She has a reputation for quality so it’s not surprising that Feargal Quinn’s Retail Therapy contacted her to take part in their TV show in 2008. The aim of the programme is to help small businesses deal with the recession. Feargal Quinn is one of Irelands most prominent Entrepreneurs and an excellent mentor for any business looking to expand. To this day Kim counts Feargal as a friend, in her own words he’s a sweetheart and very good to her. The television series took 4 months to film. During that time Kim refurbished the shop and created a new image for the business. “The process was enjoyable but hectic, It was difficult to run the shop during filming thankfully I have my family to help me with it”. It took just 10 days to redo the shop itself. That meant that Kim had to relocate to the Local community centre, where they very kindly let her use it as her base until the shop was ready to move back into. The Liberty Florist is a loyal business that takes care of its regular customers, whether it’s free delivery or some extra flowers in a bouquet they are prepared to go the extra mile to be successful. Nowadays Kim finds that a lot of her business stems from corporate orders or special events like weddings and christenings. Whatever the occasion they have what you need. Kim’s favourite flowers are tulips, keeping in theme with her favourite season; springtime. The Liberty Florist will feature on Feargal Quinns Retail therapy on RTE again this March.